Ships tomorrow if you order in the next 23 hours 27 minutes. Hawthorn is a plant that produces berries. Hawthorn berries are rich in flavonoid-type compounds that may support cardiovascular and circulatory health. Horsetail extract is derived from the horsetail plant, which is an astringent herb and diuretic. Of its many benefits, horsetail contains a compound that helps maintain flexible arterial walls. Chromium is a mineral that may help raise HDL cholesterol levels and aid in heart health. 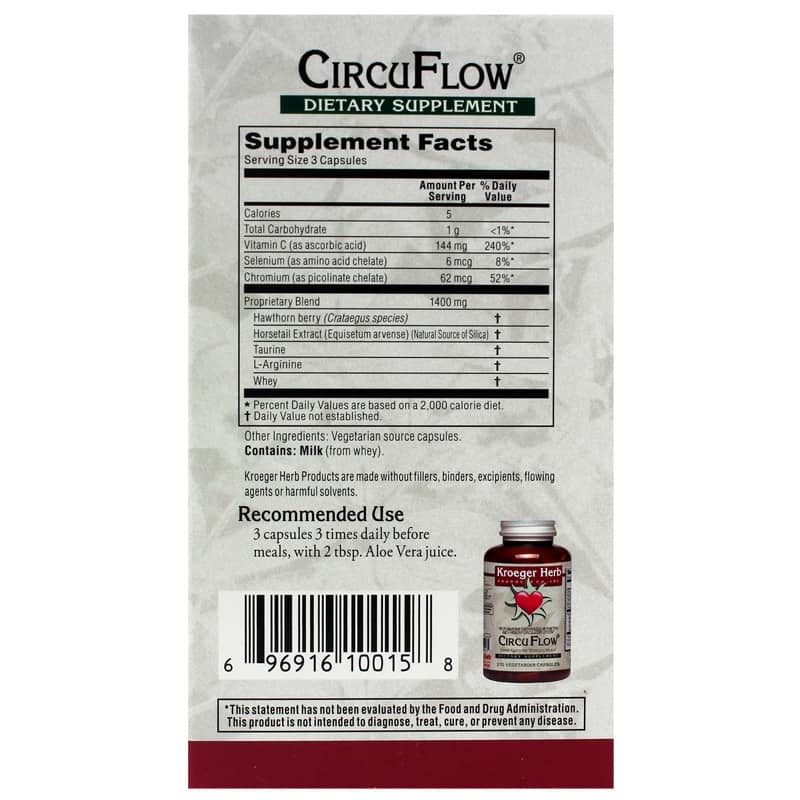 Kroeger Herb Products uses all of these natural ingredients in its CircuFlow, an herbal supplement that helps maintain cardiovascular function and a healthy circulatory system. This supplement is free of fillers, binders, excipients, flowing agents and harmful solvents. 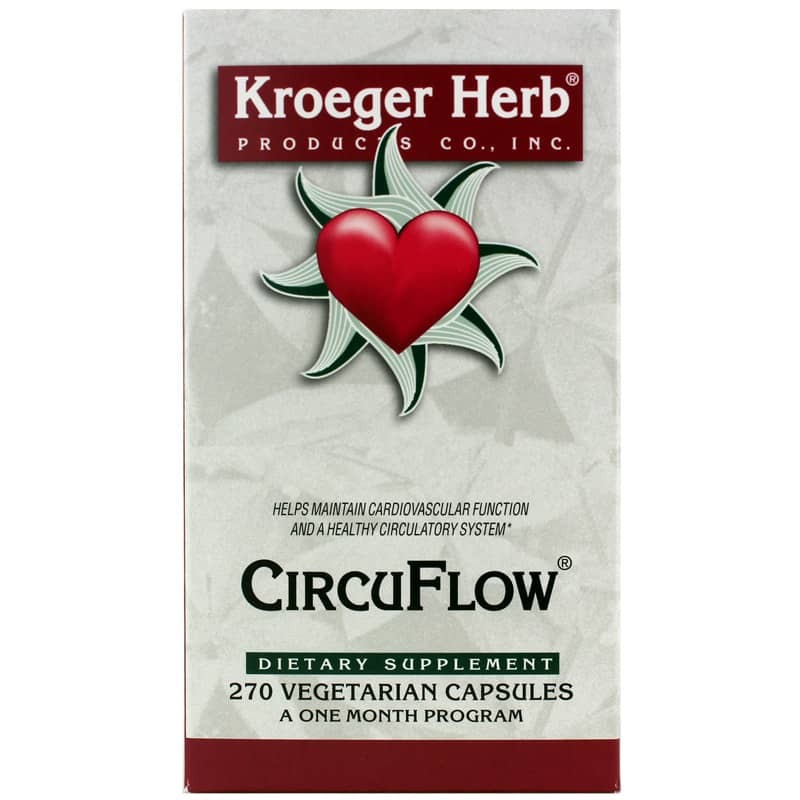 If you're looking for a natural supplement that supports a healthy heart and arteries, check into Kroeger Herb Products' CircuFlow. Order online today! Other Ingredients: vegetarian source capsules. Contains Milk (from whey). Contains NO: fillers, binders, excipients, flowing agents or harmful solvents. Adults: 3 capsules, 3 times daily before meals, with 2 tbsp. Aloe Vera juice.